The first mention of Jackie Robinson that I can find in newspapers came in 1937 when he was 17. 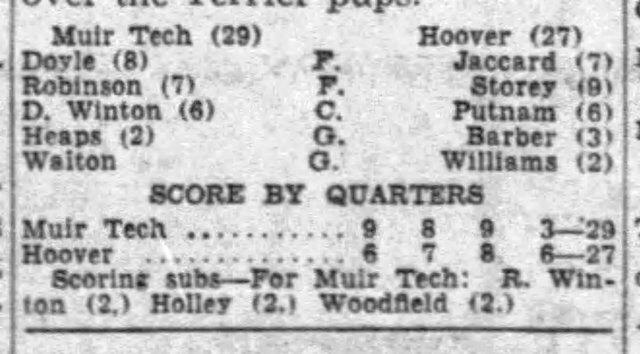 On January 13, 1937, Robinson, playing for Pasadena, California’s John Muir Tech, is in a box score in the Los Angeles Times in a basketball game between Muir Tech and Hoover. Muir Tech’s Terriers won 29-27. Each year, on April 15, major league baseball commemorates Jackie Robinson’s debut in the majors – the day that baseball was, finally, integrated. 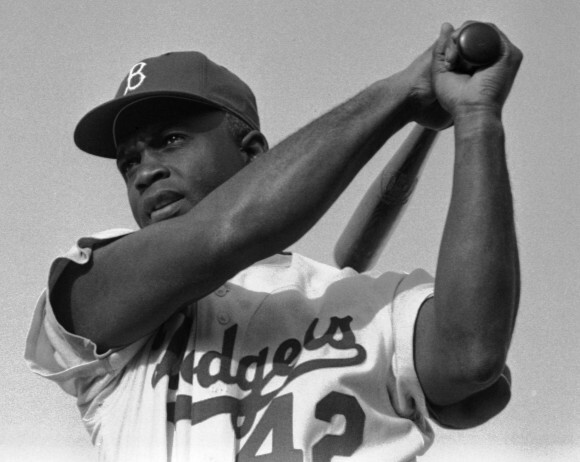 Today, every major league player in every major league game will wear Jackie’s number, 42. Everyone knows that Jackie was a Brooklyn Dodger. 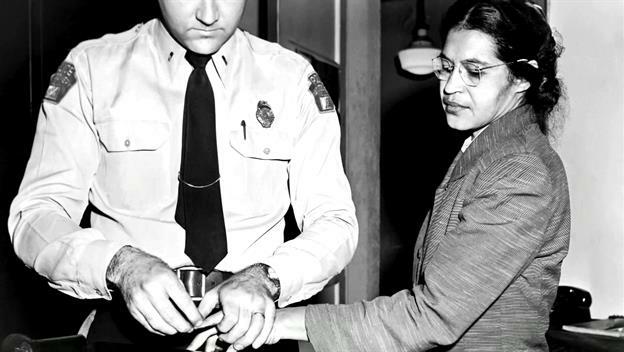 Parks refused to give her bus seat to a white man in 1955, which led to the Montgomery, Alabama bus boycott which led to the civil rights era which led to the end of segregation … eventually. Parks refused to give her bus seat to a white man eight years after Jackie Robinson broke the color barrier in baseball. Which shows you how important, and yet how unfinished, Robinson’s achievement was. April 15 was Jackie Robinson Day. 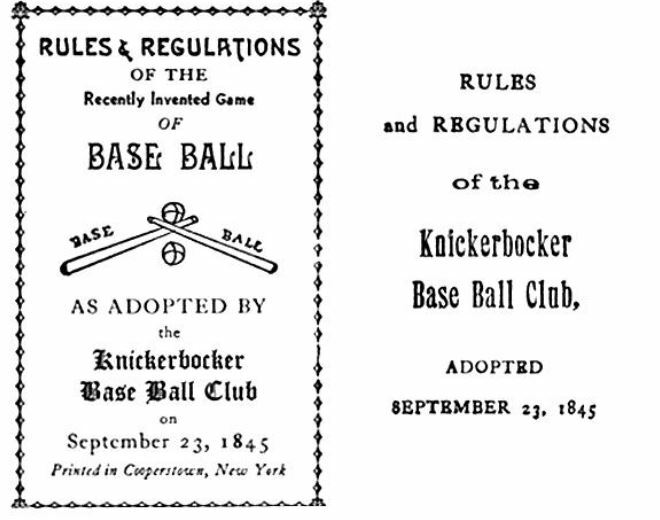 And, if you think this post is superfluous because it is a few days late, I remind you that Major League Baseball took decades to recognize that segregated baseball was a horrible, unconscionable thing. So, you can see that it’s just polite to let my few days of tardiness slide. 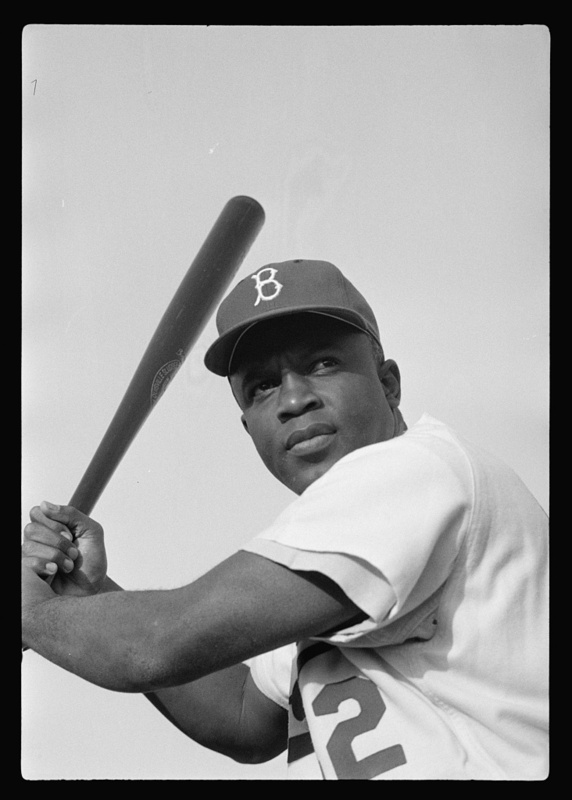 On Tuesday, April 15, 1947, Jackie Robinson played in a game with the Brooklyn Dodgers. In that moment, he integrated major league ball. Baseball changed. America changed. And, the civil rights movement was moved profoundly forward. Today, major league baseball celebrates Jackie Robinson – and the impact he had on the game of baseball and on the battle for civil rights. Major league baseball has retired Jackie’s number 42, but, in tonight’s games*, in honor of Jackie, every major league player will wear #42. Robinson was clear in his autobiography I Never Had It Made that civil rights meant far more than just allowing a black man to play in what was until then a white man’s game. Civil rights in America, he explained, is not won until every person – black or white, male or female, rich or poor – is afforded the same rights and the same fair shake in our society. We’re not there yet. There’s a “superstar” ballplayer (who goes nameless here) who likes to Tweet a lot and tell reporters that we fans have no idea – no idea – how hard a ballplayer’s job is … how hard it is to live his life and do what he does. I agree. I have no idea how he does what he does out on the field. I know it takes enormous work and dedication to make it to the highest level of sport; to make it look so easy when I know it is not. But, he has no idea – no idea – what Jackie Robinson endured on the field and off. It was not an easy life for Robinson and he could have walked away. He did not. And, for that, ballplayers and fans alike – all Americans – owe him an enormous debt. Robinson started and played first base that night. That game, he later said, was a “miserable” one for him. He went 0-for-3, reached base on an error, and scored a run. But, the Dodgers won, defeating the Boston Braves 5-3. * Tonight’s Baltimore Orioles – Tampa Bay Rays game has been postponed due to rain. They’ll wear their #42 jerseys tomorrow. There’s No Plate Like Home. Back in the day, baseball’s home plate was often a perfectly round – and, later, a perfectly square – chunk of marble. Iron or wood would do in a pinch. Or, a hunk of anything, really, tough enough to withstand baseball’s roughhousing 19th-century games. The Dodgers’ broadcaster Vin Scully explained the history of home plate during a game last season. Listen here. Home plate is, technically, called “home base” but rarely is it called that, in the same way that the Cincinnati Reds are rarely called the “Red Stockings” even though that is their name. Technically. Should you wish to build your own 21st-century home plate, you will forgo the marble (and the round and the square). Instead, find yourself a nice piece of white rubber and carefully carve it into a 20-pound pentagon. Emphasis on “carefully.” Because home plate’s dimensions and placement are very, very precise. Image Used with Permission By Kingofears via WikiMedia Creative Commons. The pentagon shape was settled on in 1900 to help umpires better see the strike zone. Thank the 1880s Baltimore Orioles for the creation of a home plate made of rubber. 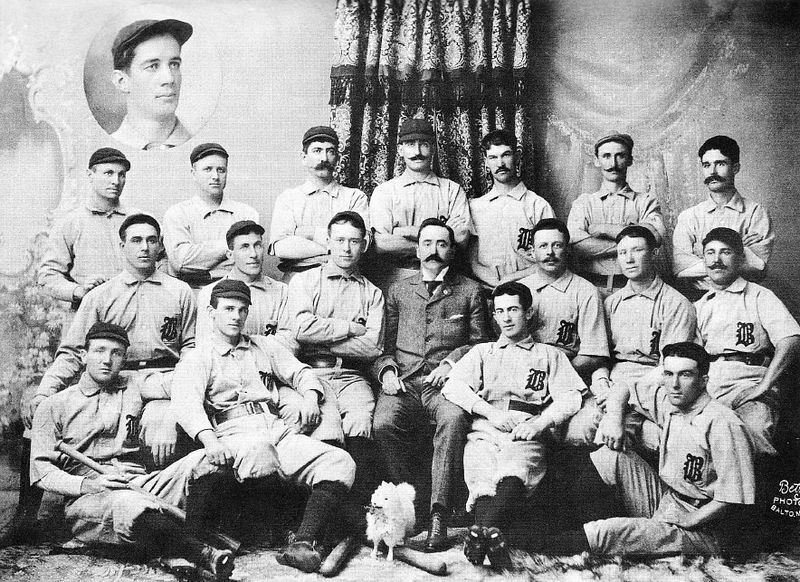 1896 Baltimore Orioles. Public Domain Image. The rubber home plate was the invention of lefty pitcher Robert Keating, who pitched one big-league game for the Orioles in 1887. Keating’s one-game career was rough – a complete-game loss that left him with a career 11.00 ERA. Apparently, Keating knew his baseball days were numbered, and that same year he patented one of many dozens of inventions that he would create during his lifetime – a much safer rubber home plate to replace the stone and iron ones that often led to injuries. Keating is rarely remembered for this important contribution to baseball. Instead, he is best known for the Keating Bicycle, a “safety bicycle” which had front and rear wheels that were the same size. 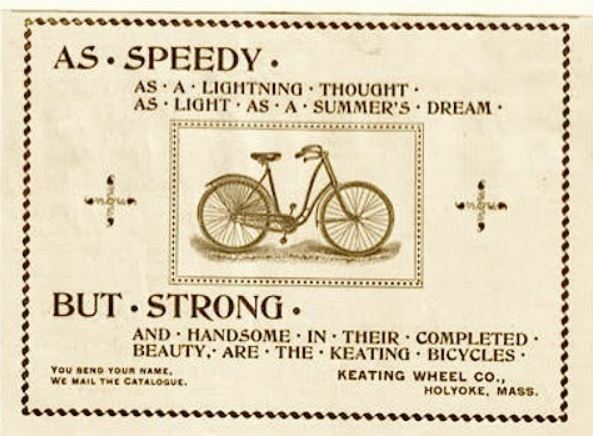 This was an alternative to the dangerous big front-wheel numbers that people seemed all crazy for in the 1880s. Keating fans will also tell you he invented the first motorcycle in 1901, a full year before it was “officially” invented by someone else. But, back to baseball. 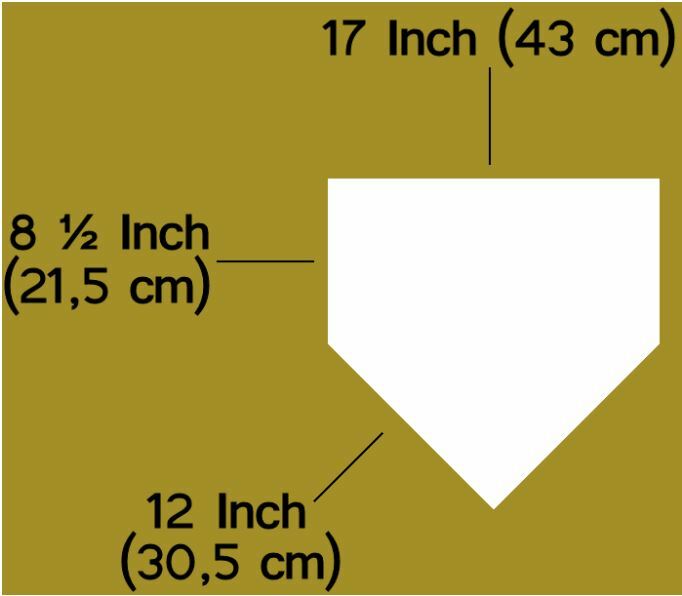 Here’s what you should know about home plate. * Major League Baseball’s rules “suggest” that home plate be positioned in an “East-Northeast” direction. This is to accommodate batters during sunny day games. Of course, most of today’s baseball is played at night under lights – or indoors – so it’s much less important. Still, rules are rules, even when they’re just suggestions, and you’ll see that many modern ballparks still properly place home plate to the east-northeast. * Modern-day rubber home plates are durable, sure, but they’re no marble. Today’s major league teams will usually wear through two home plates each season (they’ll bring in a fresh plate around the All-Star Break). Minor league teams will often squeeze a couple seasons out of their home plates. * Umpires have their own very specific rules for the care of home plate. They will dust it with a brush before each half inning and whenever needed. The umpire will step to the front of the plate, turning his back to the pitcher’s mound before dusting, so as not to moon the fans when he bends over. Players don’t dust off the plate. Ever. * Whether rubber or marble, it’s not easy to steal home, which makes it one of baseball’s rarest and most exciting plays. Detroit’s Ty Cobb stole home 54 times in his career – the most of any ballplayer. Jackie Robinson stole home 19 times in his career, but, to this day, catcher Yogi Berra insists that Robinson was out during this famous play during the 1955 World Series.